Ericka Carranza-Perez is a graduate of Stanislaus State University (B.S. Biology with concentration in Genetics, Minor in Chemistry, 2003) and San Joaquin Valley College, Physician Assistant Studies, 2012. She came to St. Luke’s as a Physician Assistant student in 2012. 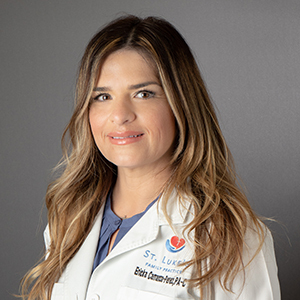 After completing her internship training at St. Luke’s Family Practice, she became licensed as a Physician Assistant, and joined the practice full-time. Ericka focuses on providing primary care to uninsured patients. In 2016, Ericka also took on the role of Office Manager. Her family owned two local pharmacies, and there she gained considerable experience in pharmacology and the day-to-day management of their business. She and her husband have two beautiful young daughters, and they enjoy traveling to local beaches and their pet dog. She attends St. Anthony’s Catholic Church in Hughson. She is fluent in English and Spanish. Erica Gonzalez came to St. Luke’s Family Practice in 2011 after providing end-of-life care for her mother. 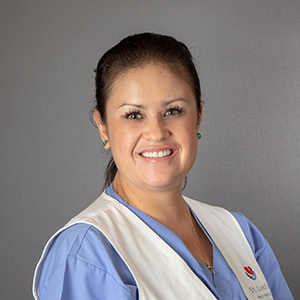 She has been a registered medical assistant since 2000, with a wide range of outpatient and urgent care experience. Additionally, she completed both her administrative and clinical state certifications in 2015. Her ready smile greets all who come to the office. She is the main point of contact for outside referrals and authorizations. She also performs vaccinations, in-house testing, and helps evaluate uninsured patients seeking care. She enjoys spending time with her three boys, and whenever possible making long road trips with her youngest son. Erica also enjoys cooking for her family. She attends Sacred Heart Church in Turlock. She is fluent in English and Spanish.